Day 3 Tu Gloria Ierusalem. The Parish Mission Continues Afterwards! In 1823, Saint Paul Outside the Walls basilica, Rome, was destroyed in a terrible fire. 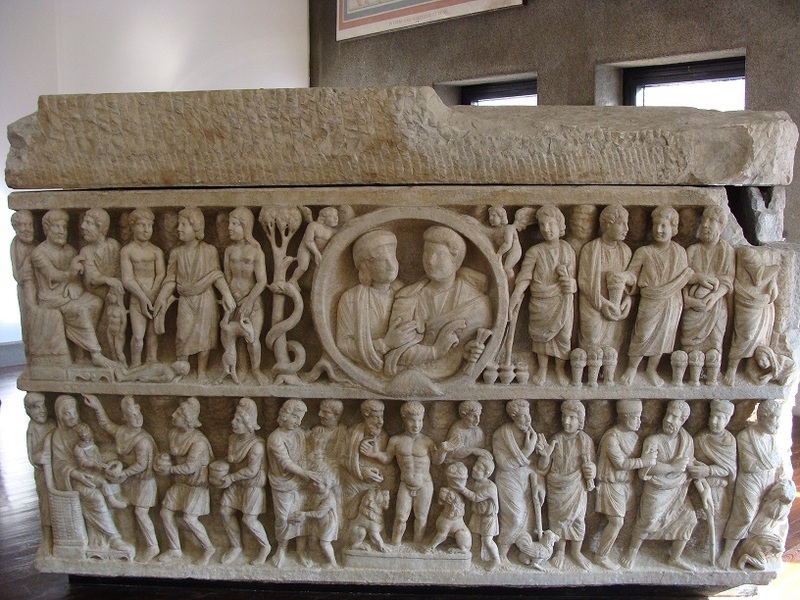 During the reconstruction works in 1838, a splendid sarcophagus from the 4th century AD was found near St Paul’s tomb. 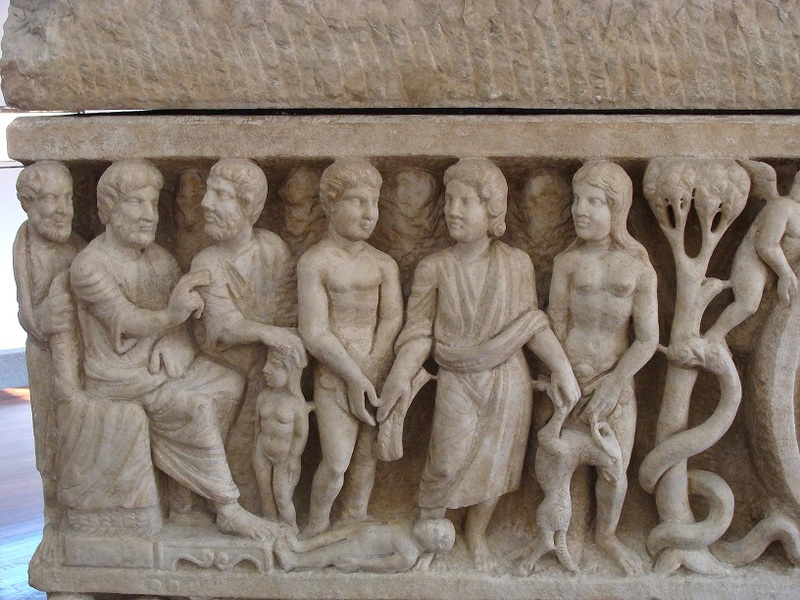 The beauty and the profound nature of the Biblical scenes that were sculpted on the face of the tomb, has inspired its title as the Dogmatic Sarcophagus. Today, this great work can be admired in the Pio Christian collection in the Vatican Museums. It is possible to subdivide the front of the sarcophagus into four thematic zones which are divided by the circular frame that contains the sculptures of the dead spouses and the scene of Daniel in the lion’s den. We will focus our attention on the left-hand side of the sarcophagus to meditate on the relationship between the Creation in the upper portion and the Epiphany that is directly below. The Son turns his head towards the Father. The Holy Spirt, has placed his hands on the Father’s throne to reveal His participation in the creative act. Between the Three persons of the Divine Trinity there is an intense exchange of gazes which underline they share a profound communion and love. 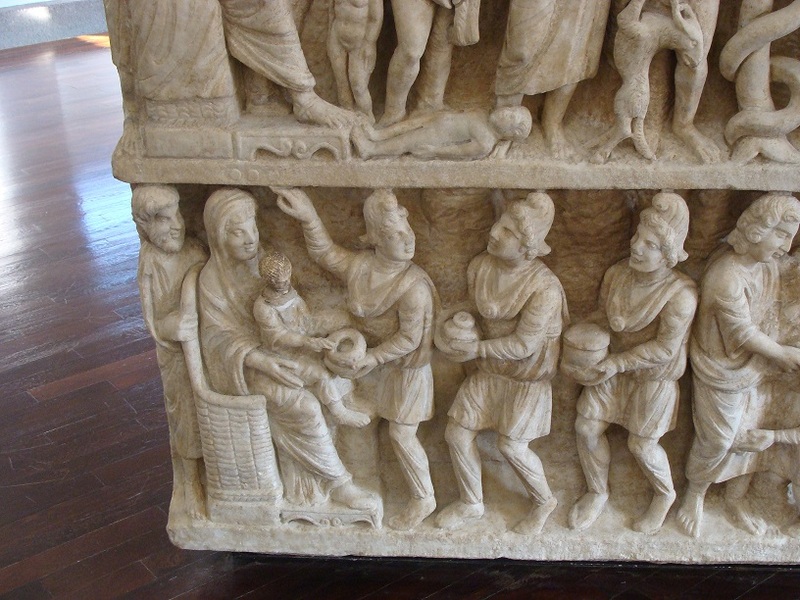 In the lower part of the sarcophagus there is the Virgin Mary with Child. She is sat upon a throne just like that of the Father’s. The three Kings approach the throne to adore the Christ Child and to present their gifts. The Child extends his hand to touch the casket of gold that was brought by the king and symbolises Jesus’ regality. The second king brings incense to represent Christ’s divinity and the third king myrrh which is used to embalm the body and is a sign that the Child was born to die. The Virgin Mary welcomes the Kings and places the Child before her guests. She represents the Queen Mother, the Mother of God who offers her Child to all people who are represented by the Kings. The first king indicates the three stars that shine above Maria and the Child. This represents the Holy Trinity. In the mystery of the Epiphany we see the will of the Father to bring His Light to all people. The relationship between the Creation and the Epiphany is shown through the throne. From the “cathedra” of creation, God the Father called Adam and Eve to life. From the cathedra of the Epiphany, Christ and Mary, the new Adam and Eve, call man from darkness into light.